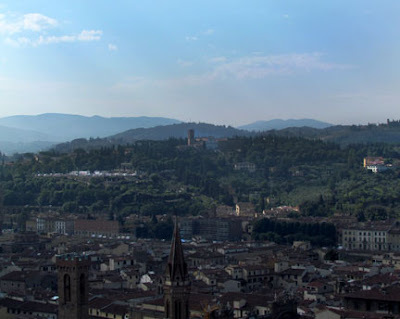 What's it like to be a single female, with an unusual take on the ordinary, in Florence for five weeks with a new camera? Come along and enjoy the sights, sounds and adventures in Florence and Tuscany as seen through Ingrid's eyes. Flying insects aside, sleeping next to a ten foot tall window with shutters open wide to the world is liberating. Our bedroom window opens into a room size air shaft shared by the four levels of apartments on the front side of the building. Barbra and I have seen the movie To Catch a Thief with Cary Grant and Grace Kelly, but we don’t speak aloud of rooftop cat burglars for fear that paranoia will force us to close the windows and put an end to hearing the church bells and napping in the Tuscan air. Her twin bed is located under the window so she feels the breeze first, in its full rush. My bed hugs the wall across the room. I get a double whoosh, like a camera flash racing over me from one direction, then bouncing off the wall and sliding back over me from another. 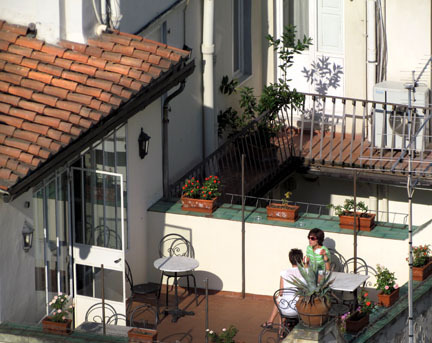 With the top end of the air shaft covered by a screen and my Marcello sleeping in the apartment directly above us, we feel safe. After a restful night we wake early because today is a big day. 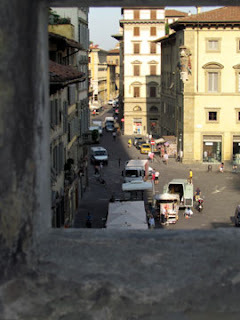 I crane my neck out our front window on Via Ricasoli. Two blocks away I can see the Campanile, the bell tower, standing tall and strong. 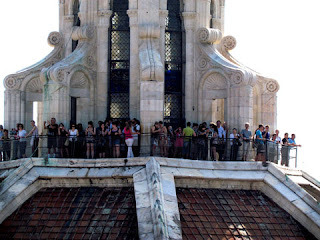 Today we’ll climb it and I’m excited because in July of 1958, I climbed to the top of the Duomo, its neighboring cathedral, and looked across to this very bell tower. I can’t help but wonder if the day was July 7, like today. 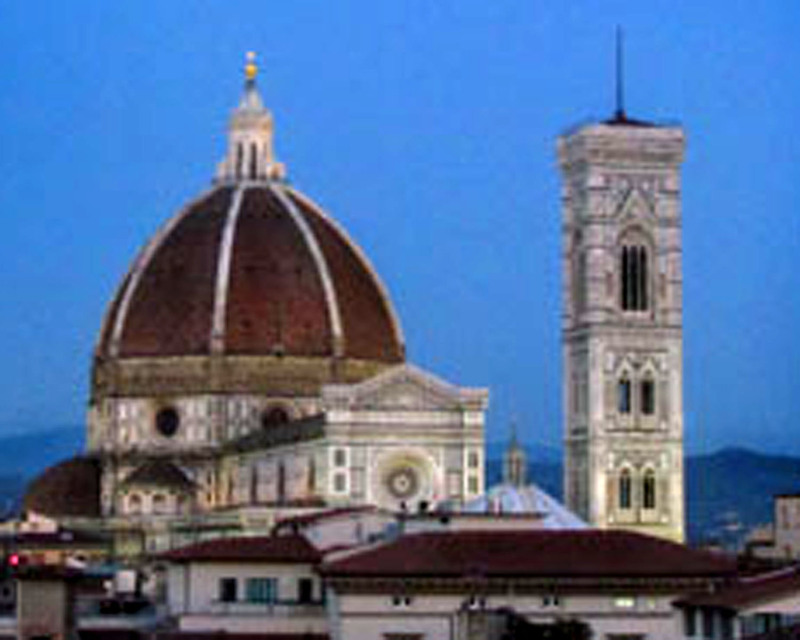 Three main buildings sit together forming the architectural religious core of Florence. 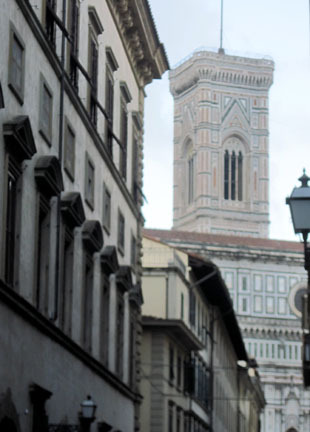 The Baptistery of St. John, from the 11th Century, is the oldest building. 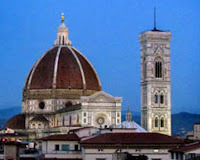 Next came The Cathedral of Santa Maria del Fiore, known as the Duomo, started in the 13th Century. 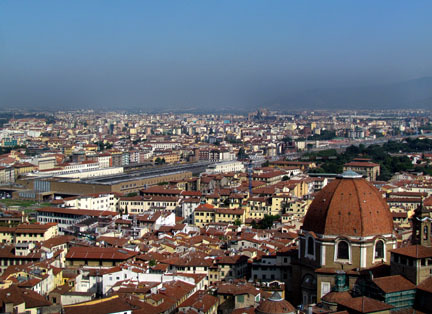 On the same property, in 1334 Giotto di Bondone at age 67, designed and began building The Campanile. 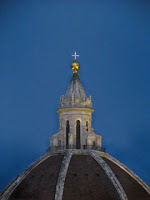 The project was taken over in 1343 by Andrea Pisano, known for the South Doors of the Baptistery, and then by Francesco Talenti who finished the structure in 1359. The square tower makes a bold statement at 278 feet tall with hundreds of embedded pieces of art and decorative architectural features. At the base, the four sides are each 48 feet wide and increase in width at as the tower rises to make it appear proportionate from the perspective of the viewer on the street. 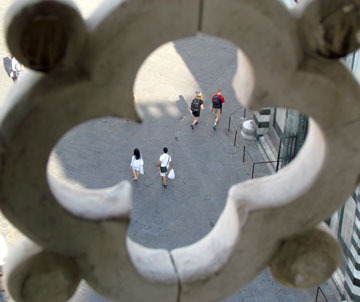 There are several reasons to be the first in line to climb the Campanile. 1) The early morning light is magnificent; 2) The morning heat is bearable; 3) There are no crowds. Also, when you’re the first group, you can easily find a mutually acceptable climbing pace, plus, you urge each other on and are primed to experience a shared moment of victory following the enclosed 414 step climb… before the 414 step descent. “Just a few more steps,” Jennifer, juggling a camera with a huge lens, calls down the stairs to Marilyn. “We’re almost there,” relays Marilyn to me between deep breaths. “I can see the daylight,” I pass on to Emily and Michael, as I round another turn that breaks out into a wide landing with seating, fresh air and large open viewing windows built into the walls. It’s designed as if the architect anticipated the climbers' need to recuperate before the next leg. There are four stages in the journey to reach the top. Each has a circular staircase of cut stone that opens out into a viewing area. If you make it to just the first, you are rewarded with gazing down to watch the city brush sleep from its eyes and welcome the new day as street artist’s set-up shop and townspeople walk purposefully to their jobs. After the second leg, an unexpected view of the rooftops shows another candid view of city life. After the third, a truly spectacular view of the city stretches past the city center. And from the top, a breathtaking panorama of the Florentine countryside. Way up in the sky, I find it curious that these architectural wonders look eye-to-eye, like man and woman, one a tall sturdy angular monument covered with geometric designs in white Carrera marble, green marble from Prato, and red marble from Sienna; the other larger architectural masterpiece, a cathedral with a massive dome covered in red brick, wearing a headpiece (“cupola”) topped with a copper globe with an unadorned cross reaching up to the heavens. I look across at the tourists standing on at the railing of the cupola and search the crowd for a ghost-like remnant of me as a child in 1958. The ascending walk up the Campanile speaks to the body of trudging, one foot in front of the other, until muscles instinctively know the next move. With brief refrains to enjoy the sights, the legs take you upward until there is no further height to gain. 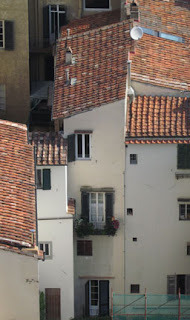 The view is unexpected and you feel both the isolation and joy experienced by the bell-ringer (“campanaro”) who climbed the steps each day to ring the bells to call the townspeople to worship and watch over the countryside, signaling when danger approached. Looking out over the landscape fosters a sense of ownership as the entire kingdom is reduced to tabletop pieces of a giant board game. The descending walk is cautious, requiring slightly less physical effort, but more mental effort in navigating the narrow steps and dodging upcoming pilgrims. 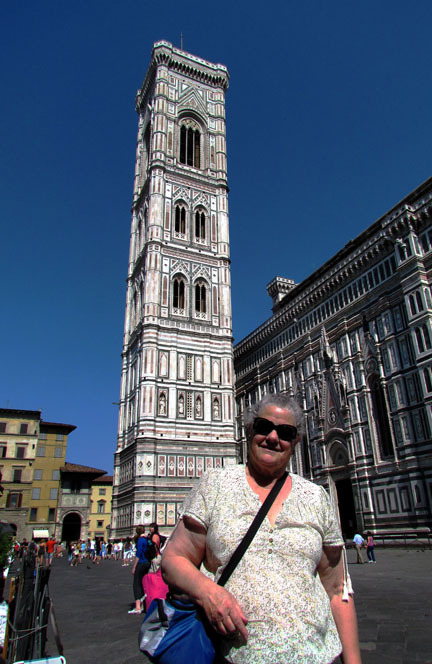 The bonus – your promised victorious photo in front of the monument before you move on to the local gelato shop and then to museums with more stairs. At day’s end as the darkness walks us home, it has been a long and sticky 12 hours of sightseeing, street photography and dining al fresco. Our clothes are indistinguishable from our skin as they half hang and half cling to our bodies. I don’t have to see my reflection in a window to know I resemble a wet sheepdog. 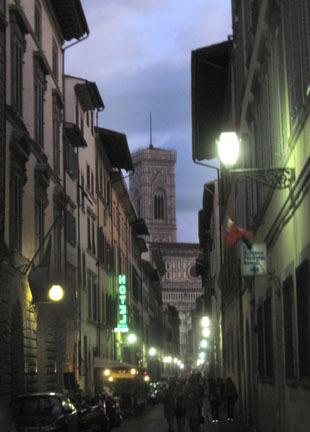 Near our apartment, we pass Marcello and Sophia walking down the street. Marcello wears his typical bright colored linen pants and white linen shirt with rolled up sleeves, but I am so tired I can barely capture his manly image in my mind. Sophia appears fresh in a floral cotton dress with straps tied over her bronze shoulders. I assume they have dined out and consumed wine because his wife acts unusually jovial and sings a repetitive verse. Marcello’s eyes sparkle, as always, and he tips his head in our direction as if to say hello, but my exhaustion from the day has already left my body so flushed, there is no blood left for blush. “Cantare, cantare,”she says tugging on his arm, urging him to join her in singing.